Preheat oven to 300°F (150°C). 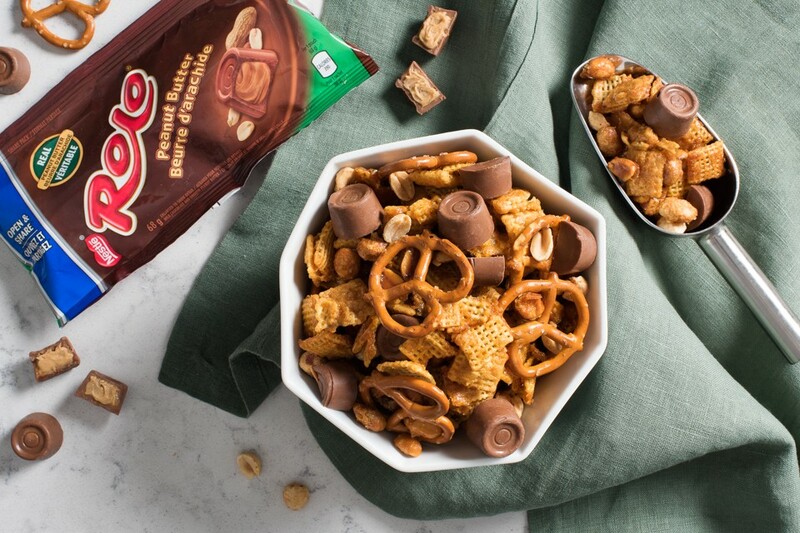 Toss together cereal, pretzels and peanuts. Spread onto large rimmed baking sheet. Set aside. Combine butter, sugar and corn syrup in a heavy-bottom saucepan set over medium heat. Bring to a boil. Cook, stirring constantly, for 3 minutes. Remove from heat; while wearing oven mitts, stir in baking soda (mixture will bubble vigorously). Stir in cinnamon. Pour caramel over cereal mixture; stir to coat evenly. Bake for 20 to 25 minutes or until golden. Remove from oven and immediately scatter ROLO® Peanut Butter over top and sprinkle with salt, if using. Cool completely. Break into clusters. Store in an airtight container, at room temperature, for up to 2 weeks. For snack mix with a bit of a kick, omit cinnamon and stir 1 tsp (5 mL) Louisiana-style hot sauce into caramel.